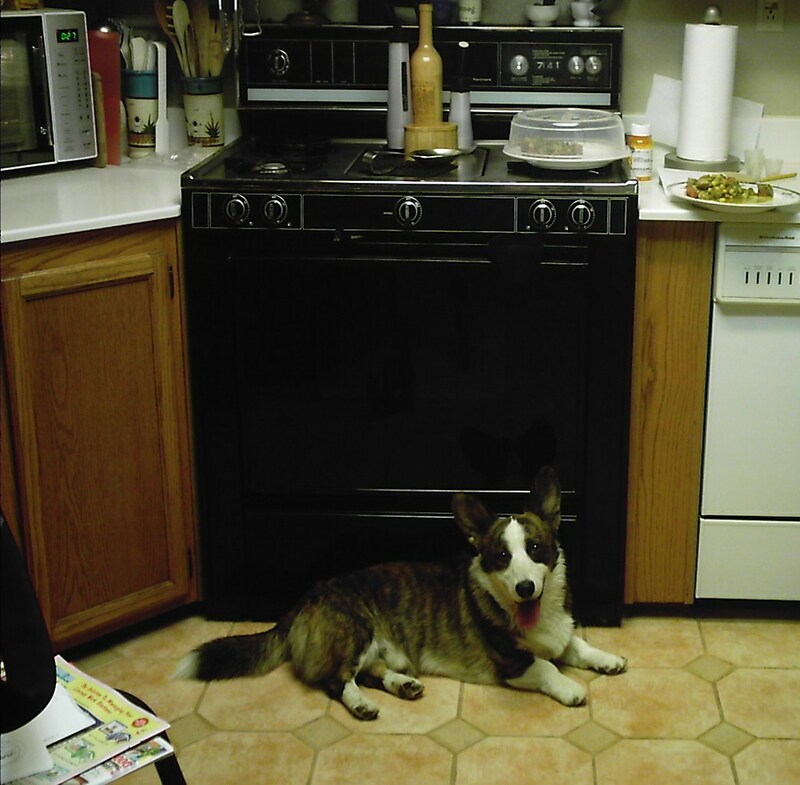 They say that Corgis don’t live far from the fridge and that includes both breeds, Cardis and Pems. It is well documented that they love their food. On a recent trip to the vet I noticed a brochure with a red Cardigan on the cover, what was it advertising? The doggy weight loss drug, “hey, we resemble that remark”! PORKY JOE aka PJ or the Pork Product! PJ, him loves his food! We go to grandma’s house for yappy hour and we also eat dinner over there quite often. PJ has his favorite place to lay, the “drop zone”. Of course PJ is a smart boy and he knows where the drop zone is located. He also takes up position in front of my stove or the BBQ grill. He doesn’t care if the oven is on, he isn’t deterred by the heat if there is even a slight chance that food will fall from the sky. Great piece – made me and my husband laugh a lot. We have 2 dogs – one isn’t very interested in sitting in the drop zone – though can get there fast if necessary – the other will sit in it waiting. Occasionally there’s treasure from the sky but I wouldn’t have thought it’s worth all that hanging about. Greetings from Sussex, England. Thanks Hilary, glad you enjoyed it and understand. I “know” nothing has ever fallen from the BBQ grill but PJ is ever hopeful, he has on occasion gotten something from the stove top but it doesn’t happen often. Ahhhh, the drop zone. A place where many a dog has happened upon falling treasure. At least your guys are too short to go counter surfing. The Shorthairs have been known to assist with the conter surfing, knock stuff off and it is a free for all! Don’t bet on it, Phyllis! LOL! 26# Tag can counter surf with the best of them! He stands on his toes and sssttrreecchheessss.